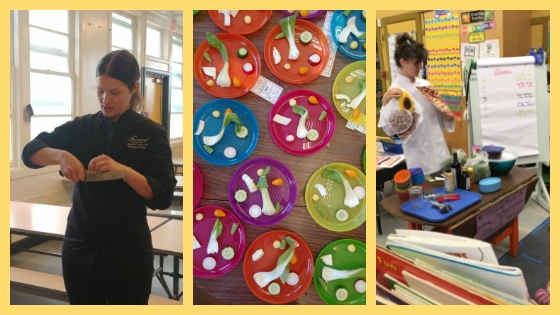 A Recipe for Impact - 2017/2018 School Year Report | Growing Chefs! At Growing Chefs! CHEFS teach kids to GROW, COOK, and EAT HEALTHY, JUST, SUSTAINABLE FOOD. Why do we do it? Because too many kids (and grown-ups!) don’t know how important food is to our bodies, our community, and our planet. Too many kids aren’t excited to make nutritious choices, don’t know how or where food is grown, or have access to healthy, fresh, whole foods. We’re on a mission to change that! Too often, when we ask kids where their food comes from, they say “the grocery store!” Or when we offer a student a new vegetable to try, they say “No way! I’m allergic!” Growing Chefs!works to change this. By connecting kids and chefs, we get kids to think differently about food. Suddenly that kale isn’t so yucky after all. In our programs, kids are hands-on with the entire food cycle from seed to plate to compost--digging in the soil, planting seeds, tending gardens, harvesting vegetables, learning basic cooking skills. Afterwards, kids that refused to eat vegetables, or kids that told us “I’m allergic!” serve themselves third helpings of salad that they grew and cooked themselves. Through experiential learning, kids are inspired to make food choices that affect not only their personal health, but the health of the community, economy, and environment. 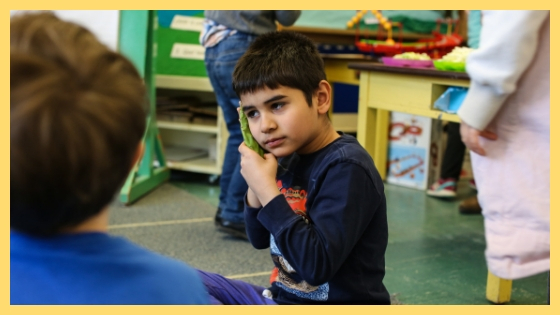 In the 2017/2018 school year, our program was in Vancouver, North Vancouver, West Vancouver, Victoria, Richmond, Surrey, New Westminster, Langley, Port Moody, Coquitlam, Burnaby, and Kelowna. It’s important to us that we evaluate the social impact we are making. Each year, we conduct pre-and post-knowledge surveys with our participating kids. In September 2017, we kicked off our Intermediate Program, working with nine intermediate level (Gr. 4-7) classes and sending 35 chef and community volunteers into the classroom to deliver 63 hands-on lessons. Lesson Six: Stir it Up! One of the highlights of our Intermediate Program is the Stirfry Competition. The kids work with their chefs to develop a recipe all of their own. The following lesson, they cook up their creations to serve before a team of special guest judges. This year, we had judges from Whole Foods, Telus, Shauna Gold Personal Real Estate Corporation, and BCIT Magazine come to taste. After long debates and deliberation the previous week about which produce and seasoning would make the best flavour profile, the students were keen to get started. Their classroom had been converted into a mini kitchen with stations for washing, chopping, sauteing, and plating. For 45 minutes the classroom bustled with activity: greens, peas, and beans plucked from the garden beds after weeks of care; bunches of spinach washed in the classroom sink with little fingers pulling back layers of leaves to rinse dark soil away. A student, tongue poking out of the corner of her mouth in intense concentration, used her newly learned knife skills to create precise, uniform cuts of broccoli, carrots, celery, beans and more. Clusters of kids gather around their dish, heads bent together in conference as they decide on their final plating. A hush falls over the students as the guest judges taste the four different stir fries. After careful thought, the judges announce the winners for best presentation, best flavour, most colourful, and most creative! Each student wins a spatula to take home. The first day our volunteer chefs introduce themselves in their bright white chef jackets, as eager students describe flowers, plants, and bugs that they associate with gardens. It isn’t long before everyone has their hands in the dirt and are planting seeds that will over the course of 3 months grow into their very own classroom windowsill gardens. As the gardens grew so did students’ curiosity of all the new vegetables our chefs and their fellow classmates brought in to share. Arugula became a new favourite word to say by many tongue-tied students, even if the surprisingly spicy flavor resulted in a few scrunched up faces. While students were often eager to try foods made with what they had grown, there were still some that were hesitant about eating vegetables. With plenty of encouragement and cheers from their peers, and by involving them in the creation of the dish, many were willing to try a taste of the vegetables that came from their gardens. Students could hardly sit still whenever it came time to start one of our cooking lessons and gobbled up bowl after bowl of the healthy vegetables they had grown, harvested, and prepared themselves. This year our foods with moods lesson fell during Ramadan and one of our students had decided to observe it for the first time. He happily participated during the whole lesson, making his baby cucumber into a superhero and discussing what urban agriculture is. When it came time for the lettuce taste test, where students taste a bunch of different types of lettuce, the chefs asked if the student if he wanted to take them home to try after sunset. The next lesson, he let the chefs know that he shared the lettuces with his mother and they did their own lettuce taste test together. He liked every single one. Every lesson after that he wanted to take home the leftover veggies to share and learn with his mother. 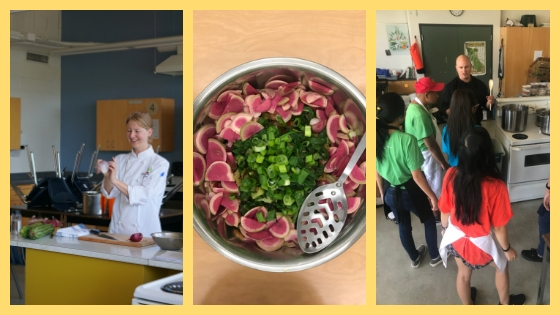 Our program continues to grow and with the amazing support of the Island Chefs Collaborative and our Victoria Program Liaison, Andrew Paumier, we were able to bring our classroom gardening and cooking program to 6 classrooms in the Victoria area. Twenty volunteers from local restaurants and the local nutritionist community helped to deliver 28 lessons to four primary classrooms and 14 lessons to two intermediate classrooms in the spring. With support from the Central Okanagan Foundation and four community volunteers we were able to deliver our intermediate classroom gardening and cooking program to a very excited class at École Glenmore Elementary. The young chefs were excited to learn about and share their experiences with food, gardening, preserving, and get cooking together. Their final lesson was a competitive stir-fry competition which resulted in a three-way tie for first place as our guest judges were blown away by the students’ recipes and skills. Chefs are the heart of our program and about half of our volunteers are professional chefs eager to share their knowledge and passion for good food to inspire the next generation of chefs. We have a number of restaurants, such as Fairmont Vancouver Waterfront, Tacofino, and Earnest Ice Cream, who provide a whole volunteer team for a classroom. Students with a keen interest in local food looking to expand their own skills and leadership abilities in the classroom and to pass on their enthusiasm. 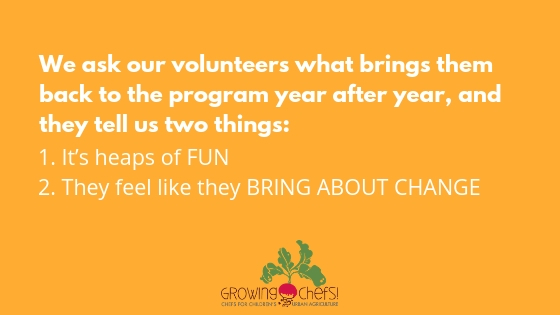 Anyone can volunteer with our program and we have nearly 200 volunteers that want to support a healthy food system and get kids excited about good, whole food. In June, we organised a Big Farm Party, to celebrate these 194 exceptional volunteers that made the 2017/2018 Growing Chefs! program possible. Our party was gracefully hosted by Southlands Heritage Farm. The afternoon was fun-filled with a pie contest, a kid’s corner, farm tours and bee talks, goat visits, amazing ice cream, snacks, and beverages donated by our sponsors, a whole range of lawn games, and some fitting farm-style live music. A newborn baby chick named Artichoke stole everyone's heart. Over 100 people attended this event, and we hope to repeat its success in the following years! Growing Chefs! is growing! To support our biggest program year ever, our team has welcomed new staff to help us deliver our record-breaking number of classrooms. This year Growing Chefs! partnered with Fresh Roots Farm to empower high school youth through food. Our Program Coordinator (and chef extraordinaire), Selma van Halder, coordinated the Community Eats portion of the SOYL summer program. Selma was in charge of kitchen management, lesson delivery, and meal preparation. Twice a week, Selma worked with six Fresh Roots youth to prepare lunch for more than 50 people. Fresh Roots farm produce grown right on the school grounds was given centre stage in these community meals, served outdoors on the farm. Every meal, we had one of our wonderful Chef Volunteers in the classroom with us to share their unique perspectives and specific knowledge with the SOYL youth. The youth learnt how to cook for 50 people, prevent food waste all along the food chain, think about how our food choices impact the community around us, and how food can be a connector between cultures. We made pesto out of turnip tops, used zucchini in everything, and tried vegan aged cheeses. We made falafel, kimchi, salad rolls, and so much more! Along with partnering with Fresh Roots Farm for SOYL, we also joined them at their youth summer camps to teach a cooking lesson on their last day of camp. Our Program Liaison (and superstar chef! ), Morgan Shupe, developed and taught two lessons with the campers. During the lesson, the campers cooked a healthy three-course meal from scratch and enjoyed a meal together. The campers also assisted in cleaning up during and after the lesson. All the campers were sent home with a recipe book so they could continue their kitchen adventures at home. Campers were introduced to kitchen basics, basic safety and sanitation, and learned how to have an adventure with their food. On the first week, we made pesto, flatbreads, a giant salad, and coconut chia pudding with local fruit. And on the second week, we made gluten-free cornbread, honey butter, another giant salad, and more coconut chia pudding with local fruit. All of the vegetables used in the lessons were from Fresh Roots Farm with some of the produce even being picked by the campers themselves. A successful first year of summer collaboration between Fresh Roots and Growing Chefs! How to incorporate food literacy and cooking into their regular lessons and the B.C. curriculum. Using the Growing Chefs! model of hands-on learning, participants not only learned new skills and how to connect these skills to their regular lessons, but also prepared a portion of the lunch for all the TEGS attendees. They also walked away with some classroom friendly recipes. Growing Chefs! has participated in a number of community events with our partners and supporters over the past year, such as the Stone Soup Festival, the Spot Prawn Festival, and the PNE’s Ag in the City to raise awareness for and educate families about food literacy issues through fun interactive games and activities. These are also great opportunities to connect with teachers interested in having our programs in their schools. We also participate in a number of on campus events at UBC, UBC farm, SFU, and Capilano University to reach university-aged students and increase their awareness of food-related issues. Growing Chefs! volunteer chefs, board members, staff members, and students have been featured in print and on screen. We’ll be famous worldwide before you know it! Interview on CTV News in September 2017 with volunteer Shannon & Growing chefs! student Sienna. Interview on Global TV in December 2017 with Jaydeen, our Development and Communications Director, & Growing Chefs! student Piper. Article in Country Life in BC “Where good food comes from: Growing Chefs! Program for school children puts emphasis on seed to plate” in February 2018. Interview on Roundhouse Radio, Fong on Food in April 2018 with Merri, our Founder & Board Chair, & Helen, our Executive Director. In our 2017/2018 year, we grew our social media reach by more than 1,000 people! If you don’t already, be sure to connect with us! Of course, this jam-packed year full of food literacy fun wouldn’t be possible without the support of our incredible donors. A huge thank you to our supporters. Older PostFrom Farms to Forks 9 Thank You!